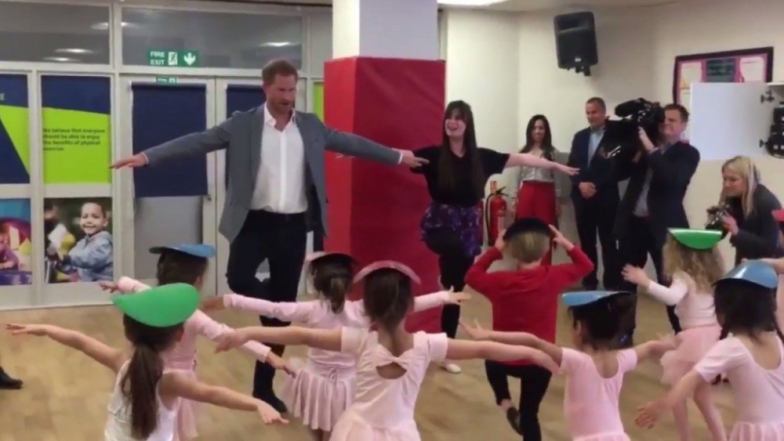 The Duke of Sussex Prince Harry recently paid a visit to a baby ballet class and put his best foot forward. Prince Harry seems to be preparing well for his dad duties and spent some time with little ones as he stopped by the YMCA South Ealing in London. He was interested in learning more about the work on mental health but while he was there he also did pirouettes with the group of little ones. This Is How Meghan Markle And Prince Harry Are Orchestrating Their Baby's Arrival. He dropped by the ballet class meant for 4 to 6-year-old children and could not help practising pirouette with the students. Well, a baby, Prince Harry and ballet combined made for an indeed cute combination. A video from the place is being shared widely on social media. He made his balancing act with the little kids and also interacted with the babies and the new mums present here. Meghan Markle and Prince Harry Officially Join Instagram and their 'Sussex Royal' Handle Has Already Registered 2 Million Followers. The little ones here were also delighted to have the royal guest and did a small performance for him. The kids and their parents were also happy to see Prince Harry come and spend some time with all of them. People on the internet were also impressed by seeing his balancing act. Prince Harry and Meghan Markle are expecting their first child together in the next few weeks. The couple is ensuring they take good care for the safe arrival of their baby. Did Serena Williams Just Reveal Meghan Markle and Prince Harry Will Have a Baby Girl?